For Isabelle K., Founder and CEO of The Superhero Company, this is a dream that has been many years in the making. She is a professional Actress-Singer-Dancer with over 15 years of global experience in theatre, film, television, commercials, voice-overs and print modeling. A graduate from Randolph Performance Academy, Isabelle has worked with major companies like Discovery Channel, Shaw Media Inc., Showcase TV, Jean Ann Ryan Productions, City-TV and St. Lawrence Centre for the Arts. Having also worked with the best names in children’s entertainment such as The Walt Disney Company and Fantasy Fables, Isabelle knows all too well what it takes to capture the imagination of a young audience and deliver a top-class entertainment experience. A self-proclaimed perfectionist, her enthusiasm for creating true to character superhero performances and giving children a strong sense of self-belief, permeates every aspect of the business. 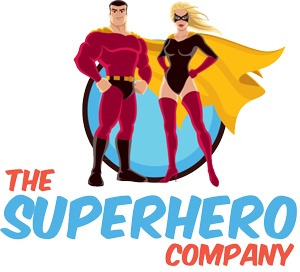 “Our goal is to provide the highest quality of children’s entertainment while being able to cater to a wide variety of clientele with interest in the superhero world.” -Isabelle K.
At The Superhero Company we have no qualms in admitting that we want to be the BEST in Superhero themed parties and events. Which is why we recruit the best professional talent and use theatre quality costumes to deliver unmatched theatrical performances. All our performers are professionally trained actors with amazing acrobatic skills and render an uncanny resemblance to some of the most beloved children’s superheroes. Even subtle elements of the performance including facial appearance and voice are well-rehearsed to add authenticity to each character, transporting our young audiences to a world where superheroes really do exist! Our Company is the only one to provide a patented, structured ‘Superhero Training Party,’ allowing you to get the details on the agenda of activities, and know exactly what to expect from the performer during the party, versus other companies that just show up and play with kids for an hour. Our team of trained professionals does more than just a fancy costume when they come to your event. They also bring an infectiously large dose of animated entertainment and high-energy enthusiasm that is bound to impact everyone in the room. Whether you are looking to organize Superhero themed parties for children or corporate events involving guest interaction or other special events (during holidays or festivals), hire us to make the event an entertainment success. We provide many of your favourite superhero characters and we offer female superheroes for girls’ birthday parties. We can organize a great superhero party anywhere – at your home, in the backyard, at a park, the gym or even the swimming pool area. We would be more than happy to customize performances to the theme of your own event. Kids love superheroes because of their amazing powers. We in return use the interaction to empower children with the message that if they believe in themselves and their abilities; train hard and keep a positive attitude; they too can become superheroes! Our patented ‘Superhero Training Party’ aims to help children develop the confidence for interacting in social situations as well as reinforce strong values and principles. We are more than happy to work with charitable causes such as Sick Kids Foundation, Make a Wish Foundation, hospital appearances, partnership with community centers, and other children’s programs. Birthday parties are memories that stay with children for life. Being a parent can be stressful enough without the added pressure of organizing a successful birthday bash. So sit back, relax and let us handle the job. And while we entertain the kids, you can spend time with the other adult guests at the party. We promise you a memorable event that will be talked about long after it is over.